The birthplace of the Renaissance, Florence is also considered Tuscany's spiritual home for rustic food and bold red wines. The medieval city's flourishing culinary scene has long been a draw both for serious gourmands and for hungry travelers on every budget. That said, it's easy to find a mediocre meal in Florence, with lots of restaurants more concerned with tourists' euros than their tastebuds. 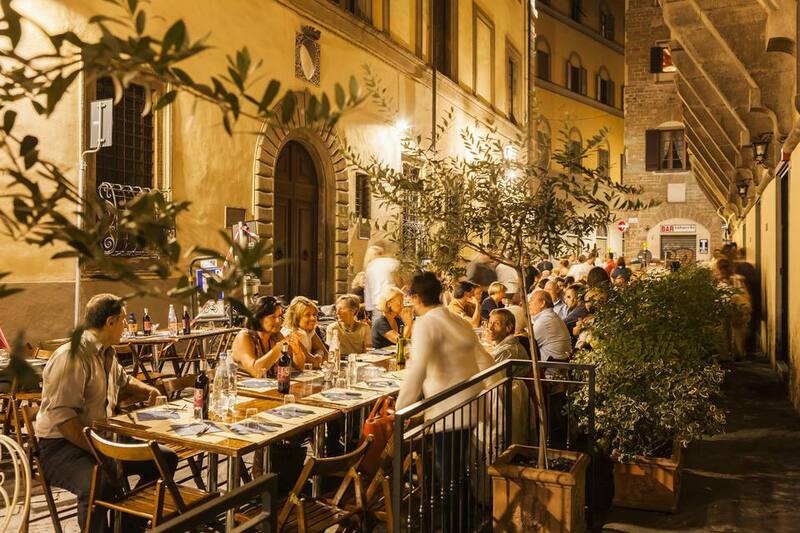 So to avoid a disappointing meal during your stay in this Tuscan city, we present our picks for the 15 best places to dine in Florence. Right in the historic center of Florence, Buca Mario is where you'll find the finest in traditional Florentine cuisine. Occupying a 16th-century buca (a typical cellar often found beneath stately palazzos), the dining room's vaulted ceilings and exposed sandstone walls are a classic backdrop to an authentic Tuscan dining experience. Start with their cave-aged pecorino served with apples and chestnut honey, and end the meal with handmade delights from the dessert trolley. This is a great place to experience a bistecca Fiorentina, the thick-cut, local steak served very, very rare. Call ahead if you want to secure a seat at this Neapolitan-style pizzeria. Fermento 1889 (referring to the year that pizza was invented) is so popular that it attempts to accommodate customers by offering three seatings a night: 7 p.m., 8 p.m., and 9:30 p.m. Located in the Oltarno district, Fermento serves classic wood-fired pizzas that have charred, chewy crusts and abundant, savory toppings. For dessert, there's traditional babà: a rum-soaked and syrupy delight. Takeout service is available. Booked solid most nights, Ora d'Aria (hour of air) is located not far from the Ponte Vecchio — the iconic bridge that stretches across the Arno River. The interiors are warmed with honey-colored parquet floors, adding modern touches like tulip chairs skirting square, linen-topped tables. The kitchen is headed by Chef Marco Stabile, who's touted as the "local boy made good." He personally curates delicacies using artisanal local products, so expect to open your wallet for this Michelin-star dining experience. The fact that Florence is a land-locked city doesn't mean you can't find places where good fish is served. Ristorante Vivo, in the Sant'Ambrogio neighborhood is such an establishment. Inspired by French bistros, the folks at Ristorante Vivo wanted to bring the raw seafood movement to Italy. With two other locations: one along the Tuscan Coast in Capalbio (summer only) and another in Milan, they've attracted quite a loyal following. Pick from a raw oyster menu or feast on their interesting but select daily specials. Do call ahead for a table. They also offer takeaway. Thank goodness for places like Trattoria Giovanni. A long morning traipsing through the awe-inspiring and vast Uffizi Gallery can really work up one's appetite. This little spot, in the Santo Spirito area, is lined from floor-to-ceiling with terracotta bricks and serves traditional Tuscan fare on the cheap — price-wise, not quality-wise, that is. Try their tasty ribollita (a hearty vegetable and bread soup) or sirloin with green pepper sauce. Here you can go ahead and order three courses without breaking the bank. Set along the Arno River and with a commanding view of the Ponte Vecchio, cozy Signorvino is a nice place for a pre-dinner glass of vino. They have a decent selection of local wines and top regional varietals and a menu perfect if you're in the mood for a light dinner. Book a space at one of their wine tasting and dinner events or pop into the wine shop for a bottle to go. The craft beer scene in Italy has been around for some time now, hitting its stride in the mid-2000s. Well-known Scottish beer company, Brewdog, opened this punky outpost (the only one in Italy) in 2014. Located near Santa Maria Novella station, the spot has become a popular hangout for locals hipsters and the international crowd. The kitchen makes pub grub until midnight. When the traditional Italian breakfast of a cappuccino and a pastry isn't quite enough to kick-start your day, head to Le Vespe for a North American-style breakfast. This bright and cheery cafe's morning menu includes such classics as eggs and bacon, stacks of pancakes (dripping with authentic Canadian maple syrup), bagels with cream cheese, and even avocado toast. They have plenty of gluten-free and vegan options, too. At Drogheria you can sip cool cocktails and chow-down on juicy gourmet beef or fish burgers served and handmade potato chips. A local haunt, it has really great prices and it's just a 10-minute stroll from the Piazza del Duomo. Il Latini is legendary for its food and for bringing people from all walks of life together at communal tables. Here, country-style Tuscan cooking meets family-style dining to create an atmosphere where, at the end of the meal, everyone knows your name. The dining room is always packed to the gills because the food is consistently delicious. Don't miss their specialty: bistecca alla fiorentina — a 2-inch-thick steak grilled to rare perfection. The cured hams hanging from the ceiling only add to the restaurant's down-home charm. While virtually all restaurants in Italy are child-friendly, Foody Farm is a place that will produce giggles from kids and their parents. Enjoy gourmet comfort foods like fried chicken, burgers, and crunchy onion rings; the menu is broken down in categories: from the vegetable garden, the farm, and the pasture. The spacious dining room is bright and child-friendly, using reclaimed wood and cushy banquet seating. Every item comes in full or half orders. Celiacs and vegetarians are welcome. Billed as an authentic taste of Japan, Il Cuore is a lovely, rather pricey sushi restaurant that presents plates that are almost too pretty to eat. Choose from two tasting menus that include a generous array of sashimi, veggies, assorted cooked bites, plus rice, miso soup, dessert, and tea or coffee. For those who prefer to eat light, you can order à la carte. In your never-ending pursuit of Florentine art, you might not want to waste your time languishing over lunch, preferring instead to grab a quick panino (sandwich) on the run. At Semel, you won't have to sacrifice taste for fast service. Pick from a small number of unique filling — these little sandwiches are wrapped in paper for easy takeaway. They serve wine, too. Semel is across the street from the Sant'Ambrogio market. They're open for lunch only. Opened in 2014, Mercato Centrale takes up space on the first floor of the historic San Lorenzo market. Food artisans are set up in stalls throughout the iron and glass structure, creating a lively and fun atmosphere where you can try a bunch of different, high quality eats to your heart's content. Dine in or take away. There's no question that Florence is a meat-consuming city, but there are a surprising number of options for vegetarian and vegan diners. Opened in 1981, Il Vegetariano was the city's first. Drawing on regional cuisine, they present a wonderful assortment of vegetable plates, salads, and desserts. The ambiance is nothing to write home about, but the food is delicious, healthy, and reasonably priced.